Elevators have a simple but clever design. Glass balls covered in plastic make the elevator float. When the team wants to send the elevator to the bottom, they add heavy steel weights to make it sink. Underwater, they use Hercules to load the elevator with samples. Later they can send a signal to the elevator that releases the weights, causing the elevator to float back to the surface. That's the idea anyway. We've been having problems with the elevators on the trip. To start, we lost one! We dropped it over the side of the ship, but we haven't been able to find it on the bottom. It also does not respond to the signal to drop the weights. 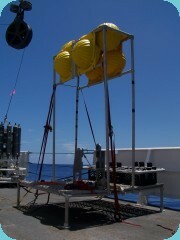 Without this elevator, the team must consider bringing the ROVs up more often in order to get their samples. We had also lowered a second elevator underwater for several days. This elevator had fish and crab traps to see if we could capture samples of the animals at Lost City. We sent the signal for the second elevator to drop its weights, but it did not return to the surface! We waited and waited. Hours later, the crew on the bridge spotted it in the water. To recover the elevator, the crew launched a small boat and towed the elevator back to the ship. Then a crane lifted the elevator back on deck. Finally the scientists retrieved their samples Ã¯Â¿Â½ a pair of large crabs. It just goes to show you Ã¯Â¿Â½ when you drop something in the deep ocean, sometimes it can be hard to get it back. We have two days left to explore Lost City, and we'll keep an eye out for the lost elevator until we leave. View more photos of the elevators.